Acrylic Roof Coatings Are Effective For Improving Energy Efficiency! When you are searching for a new roof system installation, consider a roof coating as well to defend your roofing. Aesthetically attractive, acrylic roof coatings perform as a cool roof system for your property. Bouncing UV rays away from your building, acrylic roof coatings work as a reflective boundary once applied. Because the rays are reflected away, your property will warm and cool more uniformly, decreasing the requirement for the AC to turn on. The life of your roof system and roofing materials are lengthened by this coating which impedes abrasion on your roofing system’s surface. 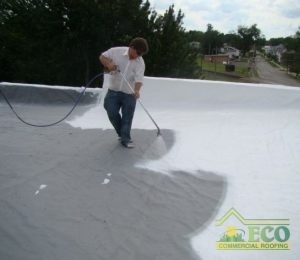 For all of your roof coating requirements, choose ECO Commercial Roofing. To decide on the best coating materials to assist your roofing, our roofing contractors work personally with you. With every service, we aim to ensure your satisfaction and to provide you with a roofing you can depend on. We listen to what you want from your roof and use the best materials and practices available to deliver. Let’s get started on your acrylic roof coatings in Texas, Louisiana, and Mississippi! Call ECO Commercial Roofing and chat with our expert roofers today at (833) 200-0571! While a fantastic look and UV resistance are superlative benefits, these are only two of the numerous advantages having acrylic roof coatings applied can offer. Applied easily and seamlessly on to your roofing system, this roof coating supplies lasting performance for you. Because of its first-rate adhesion, acrylic roof coatings can be applied to various types of roof system materials. This adhesion and its durability not only ensure a lasting coating, but protection during storms and intense winds. Acrylic roof coatings do not let dirt and debris adhere to the top of your roof system. The benefits and defense offered to your roof by simple to apply acrylic roof coatings help extend the life of your roofing system. ECO Commercial Roofing supplies you with top-notch application and installation from a roofing company you can trust. Our skilled, certified roofing contractors offer you excellent customer service and a roofing you can believe in with each service. No matter what service you want, we are always on hand and happy to aid you. Speak with our skilled roofers today! Contact (833) 200-0571.